Heat oil over medium heat in a large (4-6 quart) pot. Add kernels to the pot, and cover loosely with lid, leaving some room for steam to escape. As corn starts to pop, shake the pot periodically to ensure even popping. When time between pops increases to 3 seconds, remove from heat and shake pot one final time. 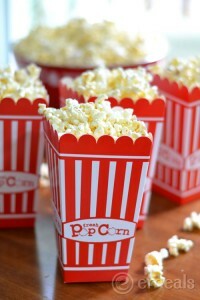 Transfer popcorn to a large bowl, and add desired toppings.